We all know that organic and green beauty can seem a little on the pricey side, but for the most part, you get what you pay for! Usually, it’s not just because you’re paying for an expensive label. Our first Luxe to Less is going to feature Rosehip Oil. The majority of the products I have found for you today are just 100% Rosehip Oil as this is pretty much all you could need if you really don’t want to use a million products. I really love incorporating it into my own routine myself, either on its own or as a blend in a serum product. "Rosehip oil is very high in fatty acids such as Omega 3, 6, and 9 which are important for maintaining skin health." 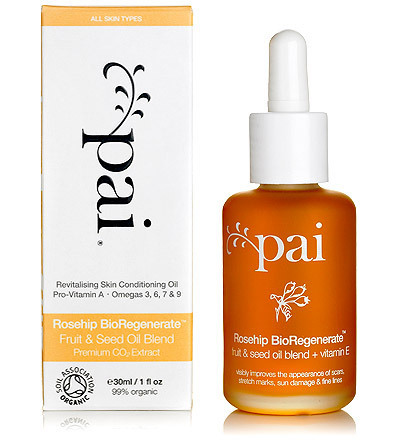 Soooo… What is rosehip oil? Ok first up, what is a rosehip?! Long story short, it is the fruit that is left over once a rose has finished flowering. Yep, just like any other fruit. The oil is then extracted from the seeds – and in some cases the fruit itself as well. The best quality oil will come when the oil has been has been cold-pressed from the seeds, so this is a great “buzz word” to look for when shopping around. Rosehip oil is incredibly beneficial for pretty much any skin type, from sensitive to oily – but PLEASE patch test for yourself! Every person’s skin is different. I have read that some people with acne swear by rosehip oil, and then I’ve read that it just made them break out. So please, you know your skin best! Good quality Rosehip oil should be quite orange in colour, and it won’t smell like roses, kind of earthy, woody, or plant-y, and will always smell different to different noses. Either way, the scent will not linger long on the skin, so you don’t have to worry about smelling like grandma’s perfume or a forest floor. I myself, pretty much like to use it for anything. Chapped lips? Rosehip oil. Weird, scaly dry skin on my boyfriend’s face? Rosehip oil. Grazed my knee because I’m a complete klutz? Rosehip oil. Below are some options from Luxe to Less (actually Less to Luxe unless you read from the bottom! ), but this is by no means an exhaustive list. Just be sure to keep your eye out for things such as “cold pressed” and “certified organic” when you’re shopping around, or don’t – it’s your skin :)! A dark glass bottle will protect the oil from UV light, otherwise just make sure you keep it in the cupboard to prolong the life of the oil. Included below are mostly 100% Rosehip oil products, with a couple of extras with some additional beneficial ingredients. All the products below are natural, organic, vegan, and cruelty-free. 100% certified Organic rosehip oil by “solvent-free extraction” ensures minimum 80% fatty acids (those all-important Omegas we were talking about). Sometimes you can find Trilogy at the pharmacy/chemist. 100% cold pressed and certified organic; contains a minimum of 70% fatty acids. Sukin is an Australian company and all of their products are 100% Carbon Neutral! Another brand you can often find at the pharmacy/chemist. This is one of those that are not 100% rosehip oil, this actually contains organic rosehip seed oil extract, organic rosehip fruit extract, organic rosemary leaf extract, as well as some natural vitamin E. These rosehip extracts are actually done by CO2 rather than a cold press method. Certified organic, CO2 extracted rosehip oil and certified organic, CO2 extracted rosemary leaf extract. The rosemary leaf will give a hint of a scent if you don’t want the straight-up rosehip oil scent. 100% certified organic rosehip oil. This is one of the few rosehip oils that is NOT in the standard dropper packaging for those you just want an easy pump-and-away-you-go. This is another not-100% rosehip oil product, but it contains a whole bunch of other great oils such as organic pomegranate oil, organic seabuckthorn oil, and organic jasmine oil if you want a little bit extra. Rachael is a green beauty hoarder and Master’s student currently living in Europe. During her studies, she focused on sustainable cities and circular economy and hopes to work in a field that will make an impact on the future of our earth. All while slathering as much natural skincare on as humanly possible.